Save your sanity with some simple tweaks and changes that will simplify your classroom management and organization routines. Have you been following along with TEACHER WEEK over on Blog Hoppin‘? There have been some INCREDIBLE link ups happening with all sorts of teacher fabulousness! Today is all about Sanity Savers. I feel like I have way too much to say about this subject! I could talk about it forever. It’s definitely one of my favorite “teacher helper” topics. The most important thing I can say is always . . . KEEP IT SIMPLE. Management and organization need to be easy and quick. That allows for a lot of extra time to create dynamic learning experiences. 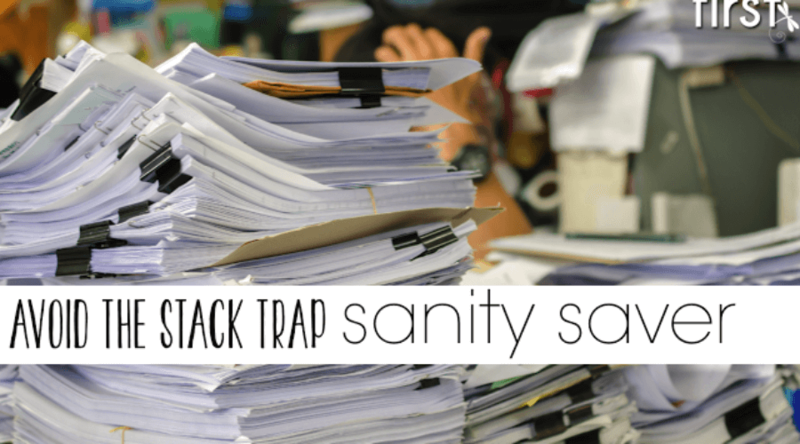 Here are a few of my favorite ways to keep management simple and maintain my sanity. 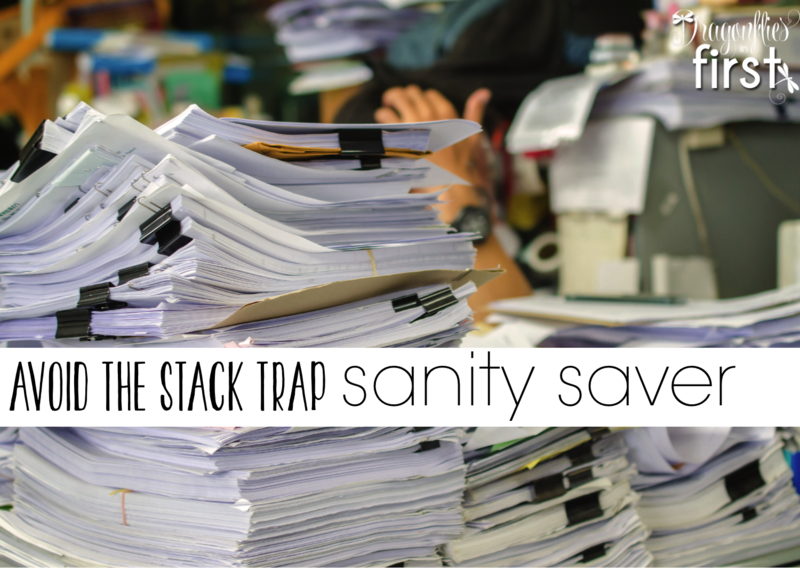 Having an assortment of stacks in your work area or desk can get very overwhelming very quickly. Avoid this by creating an “inbox” for all papers and things that will need your attention at some point, or that you need to file, or grade… whatever. DO NOT place things in this “inbox” that do not pertain to you and never will. A note regarding something that only applies to a different grade level? Throw it away immediately – hopefully as you are walking from your mailbox to your room. Something you already took care of? Get rid of it – your “inbox” doesn’t need to be any larger. Something a kid could quickly put away for you? LET THEM. That’s my inbox there – the black one with the polka dot and blue ribbon. It blends in with the room perfectly and doesn’t seem obtrusive at all. It is also quite large. The fact that its vertical means it takes up a lot less space, too! Pick a day – the same day every week – to spend 10 minutes or so going through your “inbox”. It needs to be part of your weekly routine. Sort everything into its proper home. I do this during our computer lab time. Every week, on Wednesday, I get my inbox emptied. Until then, I don’t worry about it. I know if I desperately need something before I get to my inbox, I will indeed find it there. No reason to shuffle through several stacks to find whatever I am looking for. When I go through it (it usually takes FAR less than 10 minutes) I put everything where it belongs and add things to my “to do” list as I come to them in my “inbox” stack. After that, I can focus all of my attention on my “to do” list. My inbox never gets too large because I go through it and put it all away each and every week. Side Note: A “to do” list is an essential sanity saver! For the Love of Binders! Staying organized is not too tough if you pick a system and stick to it. I use binders and could not love it more. This post has TONS of detail on how I utilize binders in my room to organize all of my masters. These binders help me plan ahead. I can order everything I need copied for our entire grade level a month in advance. Everything we do each month is in its own binder. I pull out the binder, type up the instructions and leave it for a parent helper to do as she has time. By the time the new month arrives, all of our necessary materials have been copied for us and all we have to do is plan. I never need to worry about getting all of the copying done at the last-minute. Planning in a monthly way rather than daily or even weekly may seem like it is time-consuming, but it really isn’t. Keep a consistent focus for the month and everything falls into place nicely. The hour or so it takes to pull arrange for the duplicating and prepping of the items is a ONCE A MONTH thing. It frees up a TON of time for the rest of the month. Most importantly, once it is set up it is easy to maintain and manage. I’ve mentioned this so many times before and THE BACKWARD PLANNING SERIES has a lot of detail about it. 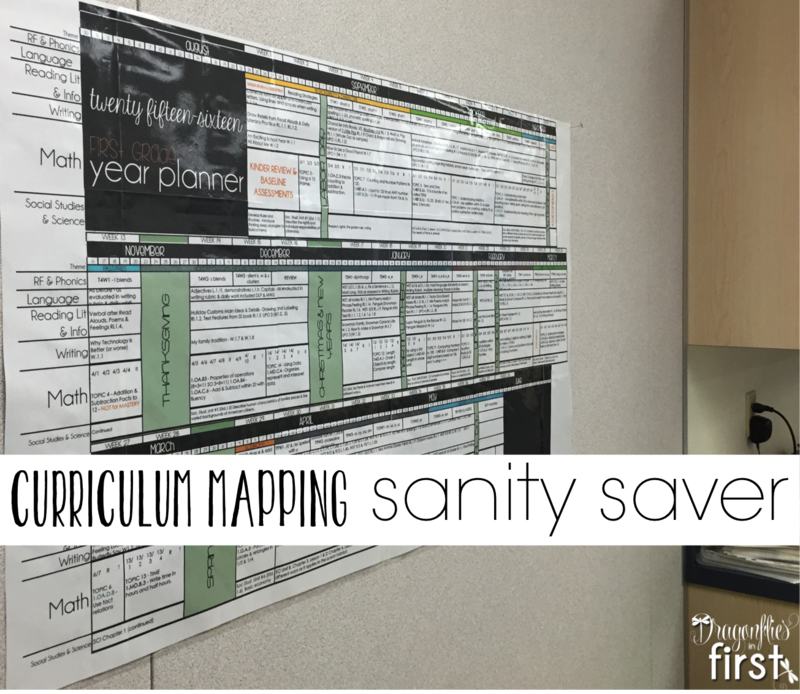 Year curriculum mapping/planning is essential to an effective school year AND absolutely keeps things sane. That map of where your year will go and how you will get there eases a lot of stress and eliminates that constant “chasing your tail” anxiety that comes with last-minute planning or wrenches thrown into your plans from the powers that be. With a year plan you will know where you have wiggle room, where your vital, key components are located in the year AND you will have the serenity knowing that you have a plan to effectively teach ALL of your standards rather than a HOPE to teach all of your standards. It’s your kiddos room. Their home away from home just as much as it is yours. They LOVE all that you’ve done to create exciting lessons, an amazing atmosphere and fabulous opportunities to learn within the classroom. Build their sense of ownership by making sure they are RESPONSIBLE for the room. We spend the first couple weeks practicing putting things away and treating things properly. I give THEM the responsibility of the room. It doesn’t seem like all that practice should be necessary. 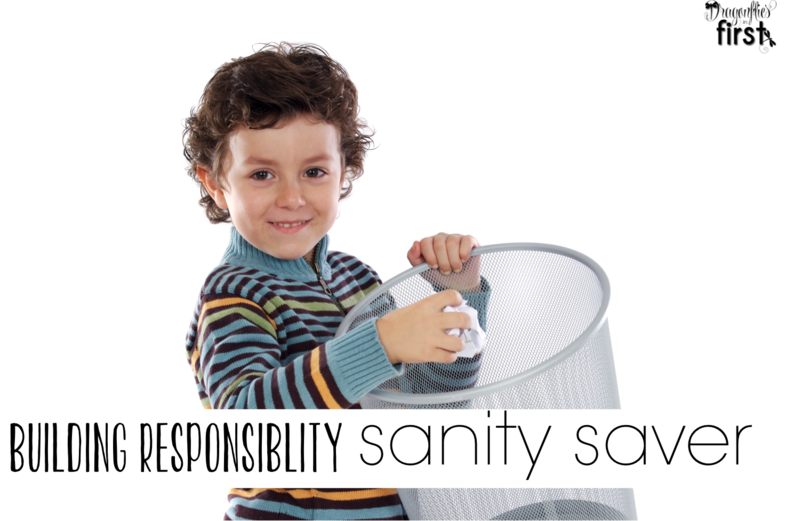 However, the simple fact is, some of those little kiddos are given absolutely NO responsibility at home. They haven’t a clue how to pick up their dirty socks, let alone put away a word work game and all its parts! Practice, practice and a little more practice is absolutely essential. Practicing the exact way you want things done and then reassuring them that you have faith they can and will keep THEIR classroom looking amazing and that all things will be in the correct place will save you tons of after school time “cleaning up”. It is very peaceful hanging out in a clean and orderly room that YOU didn’t have to spend hours getting into shape. Cleaning Up is Just Part of the Daily Fun! One of my favorite end of the day “tricks” is FIND 20. At the end of the day we spend about a minute or so finding 20 things out-of-place (trash bits, glitter specs, an out-of-place book, paper that missed the garbage bin, markers in the wrong bins, etc.). Each child works like crazy to find those 20 things. By the time that chaotic minute is over – the classroom is in AMAZING shape. Spend all your energy and time on fascinating, engaging lessons. 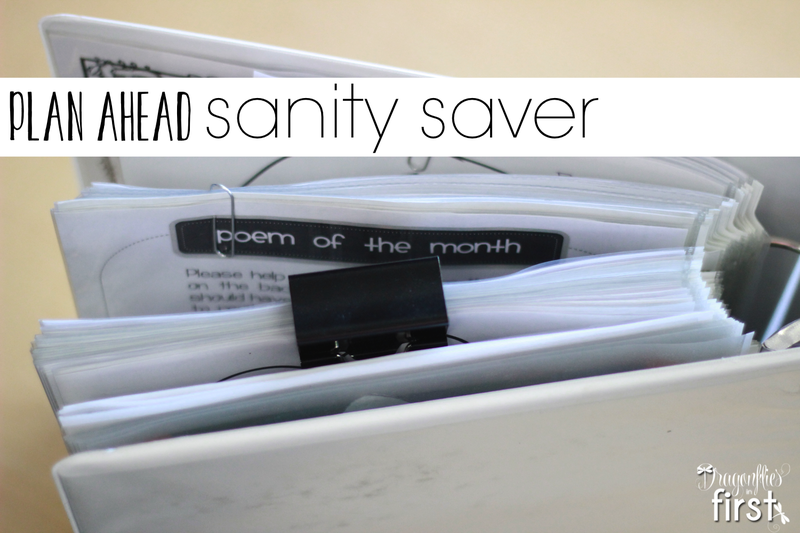 Keep everything else, simple and effective – that’s the greatest Sanity Saver tip! 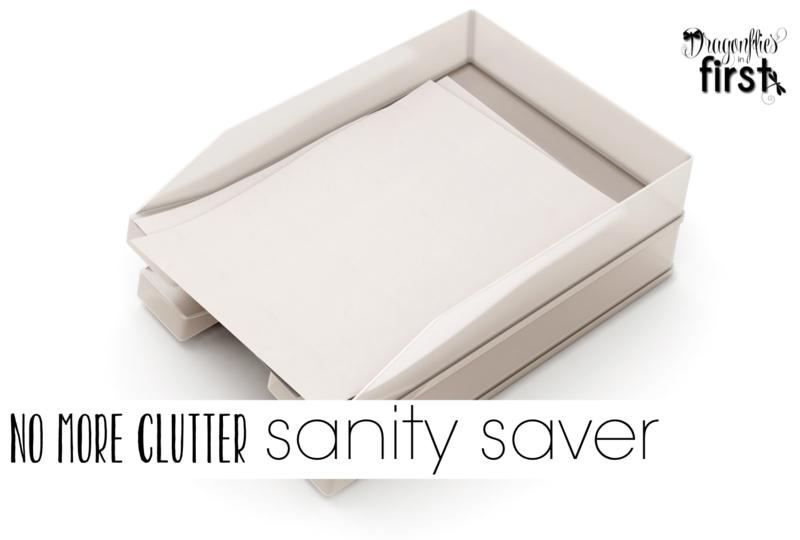 Be sure to check out of the spectacular Sanity Saver posts linked up over on BlogHoppin’! What are your favorite sanity savers? You're always so crisp and organized. Such great tips for new or seasoned teachers!